Amtrak derailment: Five major airlines are under investigation for possible price-gouging after the crash. Did Five Major Airlines Price-Gouge Stranded Travelers After the Amtrak Train Crash? 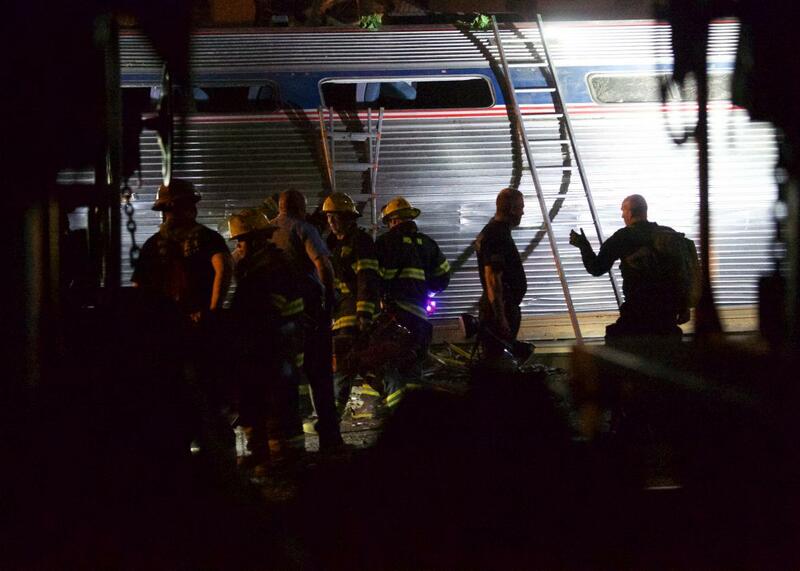 Emergency workers search for the injured after an Amtrak passenger train from D.C. to New York derailed May 12, 2015 in north Philadelphia. The derailment of an Amtrak train in Philadelphia two months ago caused immense tragedy and chaos: Eight passengers were killed, hundreds more were injured, and major service disruptions were incurred on the Northeast Corridor, a popular rail line that runs from Washington, D.C. to cities including New York and Boston. The disruptions left hordes of travelers stranded at train stations, unable to board their scheduled rides. Now the U.S. government is reportedly investigating allegations of price gouging at five major airlines that may have capitalized on the Amtrak crash by raising plane ticket prices for desperate travelers. At a Friday breakfast sponsored by the Christian Science Monitor, Transportation Secretary Anthony Foxx announced that the Transportation Department is seeking information from five industry giants—Delta, American, United, JetBlue, and Southwest—about whether they temporarily “raised fees beyond what you’d normally expect.” Calling “the idea that any business would seek to take advantage of stranded rail passengers in the wake of such a tragic event” unacceptable, Foxx said that the department is probing whether or not the airlines’ price hikes violated federal regulations that prohibit airlines from engaging in deceptive, unfair practices. Foxx’s department sent letters to the five airlines alerting them that a practice qualifies as unfair if it causes “substantial injury” to customers, “is not outweighed by countervailing benefits to consumer or competition,” and cannot be reasonably avoided by customers, the AP reports. Service on the Northeast Corridor was interrupted for almost a week after the Amtrak train derailed. Investigations are underway for the pricing of flights to certain East Coast destinations from several airports in D.C., Philadelphia, New York, Boston, Rhode Island, and Connecticut in the wake of the incident. The AP reports that the investigation was spurred in part by Connecticut Senator Chris Murphy’s complaint to the Obama administration that a flight from La Guardia Airport to D.C. was priced as high as $2,309 in the aftermath of the crash.